A look at people living outside our financial system. We already know that we have between 10 and 15 million people who work in the U.S. illegally. Do they have a bank account? Very few do. Most fear without reason that banks will report them to the authorities. Many don’t speak English and don’t understand the intricacies of the banking system. We also have another 10 to 15 million Americans who simply don’t believe a bank account will help them. And here’s a revelation: it’s believed that the population without a bank account earns more than 500 billion dollars annually. People who do not have a bank account take their checks to a specialized institution. They use check cashing businesses and must pay a fee between 3% and 5% of the total amount. As they walk out the store, somebody may be waiting to rob them of the hard-earned cash. 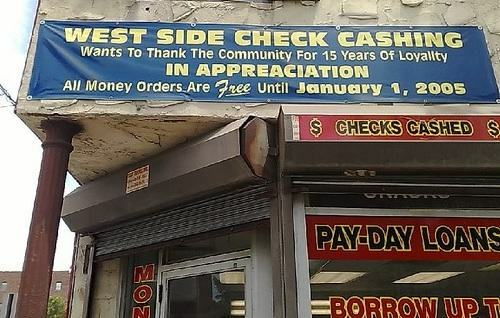 Still other fast growing businesses offer to loan them money — normally no more than $500 — in advance of payday. In this case, the fees are exorbitant; it can reach over 500% the annual rate. The Merriam-Webster dictionary gives this definition of usury: “an unconscionable or exorbitant rate or amount of interest.” Unfortunately, no authority has offered to curb these abusive practices, which are just some of the many other traps that financially vulnerable people fall into (along with predatory loan schemes such as risky mortgage loans and subprime borrowing activities). USA Today recently reported that Bank of America is planning to issue credit cards to illegal immigrants. According to Ruben Navarrete, editorial writer for the San Diego Union Tribune, the bank has already started a program called SafeSend to allow illegal immigrants to open checking accounts and send money safely to Mexico. All this created quite an uproar among those who believe that we should not encourage undocumented workers to stay in the United States. Of course, the motive for the program is not altruistic; it is simply an effort to cash in on this previously untapped resource. The credit card charges over 21% a year, a rate that is considered high by most standards. ~Chairman Donald E. Powell Federal Deposit Insurance Corporation, March 2003. Then FDIC chairman Donald Powell added that it would be quite profitable for banking institutions to penetrate that market with tools designed specifically for customers living in fringe financial services. Some employers have solved the problem of delivering checks by creating direct deposits in debit cards that the workers may use in restaurants, supermarkets and other places. Many of these employees don’t have Social Security numbers. Finally, Wal-Mart announced recently that it will sell a card for $8.94, a prepaid Visa debit card, targeted specifically at those who don’t have a bank account. We may or may not agree with those who facilitate financial services for illegal aliens, But what’s appalling here may be some of the types of financial products made available to them and others outside our financial system. We should also realize that those outside our financial system include millions of Americans who run considerable risks by stashing hoards of cash under the mattress or slipping banknotes between book pages. Their financial resources are not protected from criminal elements. Sure, the banking system and private enterprises are making huge efforts to bring them some degree of safety, but it’s also done in the name of more profit. And as we’ve seen in some cases, that too, can be just as scary as the risks some people make with their hard-earned money, as they take matters in their own hands. Jacques Sprenger is a contributing writer to The Digerati Life. Wow, I always thought that not having a bank account screws people over, but I’m surprised to the degree they get screwed over. What this is telling me is that the less you have, the more likely you’ll get “screwed over”. This shows just how challenging it can be to elevate your financial status once you’re at or near the bottom. When you don’t have much, it may take double (or more) of the effort that others require to move forward. Conversely, the more money you have, the easier it is to make or generate even more. When you have less, you can fall prey to many things — so much so that you develop a paranoid mindset about many things. You’re an easier target for many schemes, both legitimate and not so legitimate. Unfortunately, if you live in what is called “the fringes of society”, you tend to be financially unsophisticated as well; all this contributes to being stuck in a financial rut that is quite difficult to escape from. It could be the story of lots of people who hold two or more jobs to try to make ends meet. Recently, a co-worker told me she doesn’t have a bank account (checking or savings). I was baffled. When I asked why her response was that it’s hard for her to keep track of what she has and it’s easy to go over with spending (I’m guessing overdraft?). To write checks for bills she pays to get money orders each time, or goes directly to the office and pays. It was like looking into another world for me, and we work at the same place. I’ve since realized there are tons of people out there like this, and I must pass 3 of those payday advance loan business on my way to work. Such a shame. Getting people options is important but they need to be good options. Credit Unions are often much better than banks or check caching… Some banks have made real efforts to help but I wouldn’t trust them very far – you might find a bank that actually believes in honest service but they seem rare. So if you have to use one, do, just be ever vigilant against them tricking you out of money. The issue of illegal immigrants notwithstanding, I think you’re absolutely right that access to banking resources can be a huge obstacle to low income individuals — you would think that we could have some sort of non-profit bank or group that would be able to provide basic bank accounts or debit cards for low-income individuals…. while it may be a step up, the fees offered by that SiGo Money MasterCard can quickly eat away at the little money a holder might have. If you’re interested in one of those pre-paid master cards… Walgreens has a coupon for a free activation in their super saver flyer this month (mail in for rebate), which is an easy way to get started. I think it’s Visa actually, I’d need to check. The “unbanked” population isn’t just limited to immigrants or folks with low incomes. There are a staggering number of Americans who can’t get decent (or any) bank account because they ended up on the ChexSystems list. ChexSystems is a credit bureau that reports checking account activities. Unlike Experian et al, they only report “bad” activities. So, if you bounce checks or overdraw your account, and if you end up on ChexSystems list, you may find that you simply can’t open a decent bank account anywhere. It’s very hard not to have bank account especially for these illegals. Whatever it takes, choose the financial aids that works for you and pay it on time to avoid debt. I had a friend that used check cashing. Besides being a pain (he was always rushing to cash a check before 5) it also takes a significant amount of your paycheck away. As far as people with low incomes getting targeted. I had a professor friend that did a study and found that chain stores that operate in different parts of the city charge more in lower income areas which was the exact opposite of what many people thought. Apparently people in low income areas will use a local store instead of looking at different options like buying online since they are less likely to have a computer and internet access. So $5 for a paper statement and $1 for a balance inquiry at an ATM? Seems like a rip off since the only way to get a balance for free is using the web. 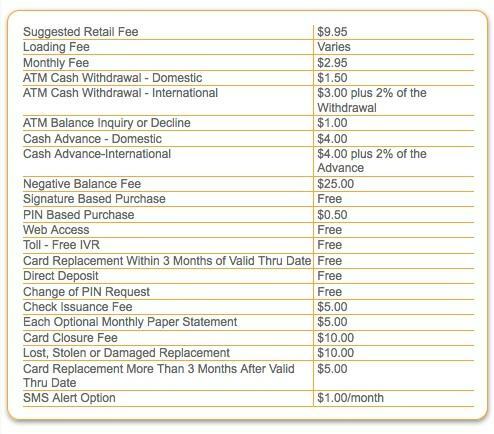 Since like many folks have stated computers and internet access will be limited for folks who don’t have a bank account these fees hardly seem like good business practice. Pretty nice of them to charge money to close the account as well. An old friend of mine had been unemployed for almost a year and her husband had been unemployed (downsized) for about six months. They have four kids. She bounced a bunch of checks (sometimes to buy groceries) and owe a lot of overdraft fees to their bank. For this reason, they used a check-cashing place when any money *did* come in — they were afraid if they tried to cash it at their bank, the bank would demand some or all of it against their overdrafts. So they paid the check-cashing fee and they also had to take care of the bills that they could pay (e.g., give the electric company some money this month or they’ll turn off the juice) with a money order because they couldn’t write a check — and a money order meant yet another fee. Recently they both got jobs again, but it will be a while before they dig out from under. Until then, they’re using the check-cashing place. Sigh. Prime example of how to keep digging a hole for yourself in times of financial desperation. While it is understandable that people do what they have to do, this post is a great warning for people on the verge of making big money mistakes such as not properly taking care of their bank accounts and not researching alternatives for saving money by avoiding unecessary fees due to being uninformed. I don’t believe in that usury should be illegal or curbed by governmental authority. If people are so hard up for cash that they are willing to pay high interest rates, who are we to say that they should not? It’s taking away a choice and restricting their freedom. Of course we might say that it’s a bad choice, and advise them not to do so, and that would be fine. But government should not step in with threats of violence to prevent people from making voluntary business deals. This is a major problem for the black market workers, they cant use a bank as they will get caught. They will never be able to get a mortgage either: if they want to buy a house, they will have to pay cash. The people who don’t know that they’re getting screwed are always the ones who will get screwed the most. Illegals don’t want a paper trail. UNfortunately, that makes them a prime target for muggings and other crimes on payday – which they are always afraid to report. This has always been the argument for check cashing places. While I think the fees they charge are exorbitant, they certainly fill in a market need otherwise they wouldn’t exist. I love capitalism! The “the population without a bank account earns more than 500 billion dollars annually” doesn’t surprise me. There are more and more people who come to the US illegally now. I think the issue is general to most countries, however, when I take a look at my bank fees, I somehow understand people who don’t trust them. There is also the cultural (and sometimes also religious) factor to consider, people just don’t want to give their hard earned dollars to banks and others don’t want to be caught in the credit tornado. Educating people and businesses (banks and financial services) is key to giving the economy enough trust to work, I think the solution is here. I don’t know why people above are griping about the fees charged by these prepaid cards. 1. You don’t really expect them to provide a product for FREE, do you? 2. I added up their monthly fee and the charges for every little thing I typically to in a month on my debit card attached to my checking account and the prepaid card is STILL cheaper than the monthly fee my bank starting dinging me for 5 months ago. My bank lured me in with free checking, now they are sticking it to me. I guess because they know what a hassle it is to change banks and update all my automatic debits. I may switch to the prepaid card entirely. I’ll save money and lose no convenience. Is A Liberal Arts Education Worth It? Got Kids? Open a 529 College Savings Account!